Shorthand references: Rising to the Challenge; the campaign. Goal by institution: Johns Hopkins Medicine, $2.4 billion. Johns Hopkins University (excluding School of Medicine, which is included in Johns Hopkins Medicine goal), $2.1 billion. Goal by purpose: Research and program support, $2.25 billion, 50 percent. Faculty/professorships, $968.5 million, 22 percent. Financial aid, $753 million, 17 percent. Capital/facilities, $415.3 million, 9 percent. Unrestricted, $111 million, 2 percent. — a $350 million commitment, announced in January 2013, from Michael R. Bloomberg, a 1964 engineering graduate and mayor of New York City. (For student financial aid and 50 endowed professorships. —Summary: More than 250,000 donors created 92 professorships, generated 550 new scholarships and graduate fellowships, and modernized teaching, research and patient care facilities. Launched the Carey Business School and the Sidney Kimmel Comprehensive Cancer Center, endowed the deanship of the Whiting School of Engineering, added a new quadrangle to the Homewood campus, and provided millions of dollars in unrestricted support for the university and health system. —Summary: More than 100,000 donors added more than 460 endowed scholarships and fellowships, nearly doubling the existing total; endowed 130 professorships; endowed the deanships of the School of Medicine and the Krieger School of Arts and Sciences; built cancer research and clinical buildings; built the first standalone home for the School of Nursing; built a new arts center, recreation center and biomedical engineering building at Homewood. –Summary: $247.5 million, or 38 percent of the total, was raised for endowment or facilities. 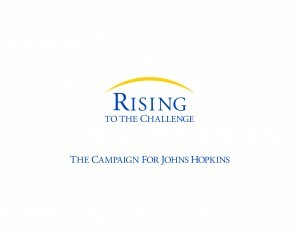 –Summary: Created 24 endowed professorships and raised $17.5 million for a major rebuilding program at The Johns Hopkins Hospital.